How to Track lost Android Phone using Android Device Manager: Google has introduced a new locator function for Android devices known as android device Manager, which helps users find their misplaced or stolen phones and tablets. The Android Device Manager can be used to help locate and remote wipe a lost or stolen phone. Hence this feature is extremely important if you’re in a habit of loosing phone or misplacing them. 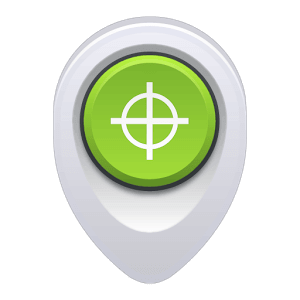 The feature works in addition to other locator offerings, like lookout and Samsung’s “locate my cellular”, but now you get the characteristic natively to your Android device. To know more about the Android device manager, browse below. 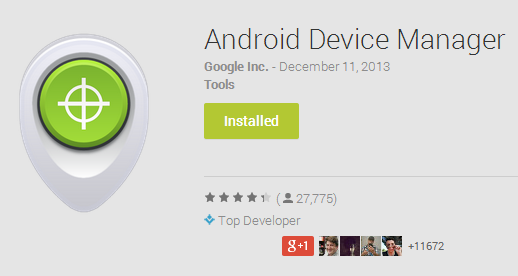 Download and install Android Device manager on your Android device or tablet. Log into the app with your registered Google account. Now follow the below steps. To use android device manager features, browse to https://www.Google.Com/android/devicemanager and log in with your registered google account. Accept the permissions to allow the Android Device Manager to access your smartphone’s location. You might be prompted to accept more permissions. Just click on the Accept button to continue. Also keep in mind that your Android device is connected to the internet. Below are some features of the Android device manager and how they will help you to find your lost android phone. You can check the present location of your Smartphone using this feature. Location will allow you to access the name of the place, where it was last seen and when it was used. Note that you can only access the location of the device which is associated with your signed Google account. If your mobile is being hidden somewhere in your house, then you can ring it remotely. 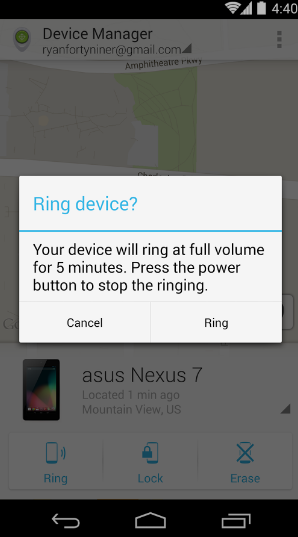 This feature allows you to give a ring to your Android device. Hence, you can easily find your lost Android mobile. This feature will also ring your Smartphone if it is in the silent or Vibrating mode. Your mobile will ring constantly for 5 minutes until it has been discovered by you. If your mobile is in the wrong hands or has been misplaced somewhere, then you can use this feature to lock it. To lock your device, click on the “Lock” option. Enter your new password twice, then click the Lock button. Once the command is sent to your mobile, it will lock it immediately, even if it’s being currently used by someone else. This feature is very useful if you have an unlocked mobile and you have forgotten it at home or with friends. 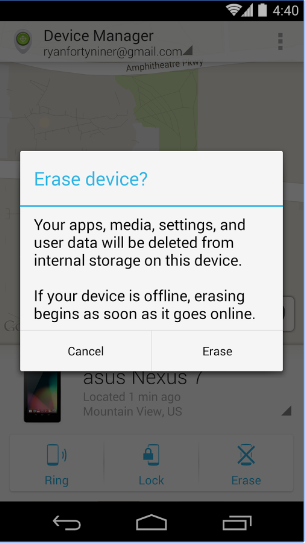 Erase tool will erase all your apps, photos, music, and settings from your device. 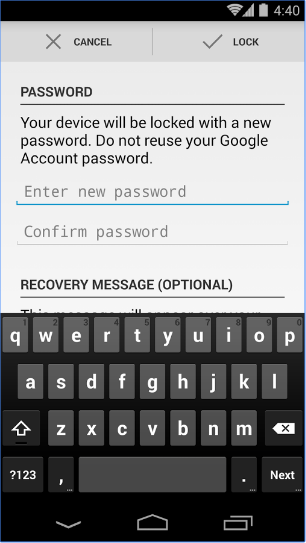 It will force your smartphone to perform a factory reset in order to save your personal data. This feature can be used if your Mobile Phone has been stolen. Note that your SD card data will not be wiped out.